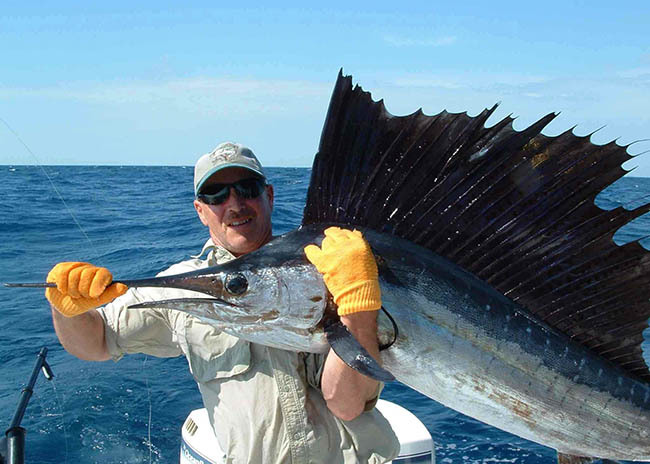 Why Do Smart Visitors Choose To Go Fishing From Cozumel Island EVEN When They Are Staying In Playa del Carmen? Dear fellow fisherman … here on the beautiful island of Cozumel, lying just off the coast of Playa del Carmen, we are proud to have one of the finest fishing grounds in the world for both deep sea and bottom fishing. That’s because here on Cozumel we are lucky enough to have one of the world’s most magnificent coral reefs – second only to the Great Barrier Reef in Australia. 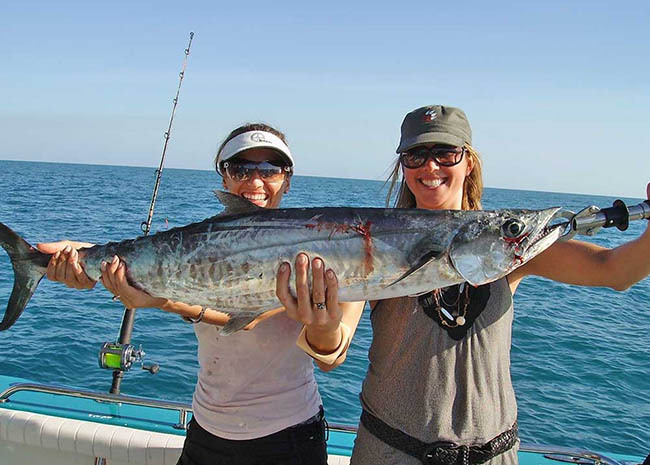 Our reefs teems with fish of all sorts and so is ideal for both deep sea fishing and bottom fishing. So good is it, that all the fishing charter boats from Playa del Carmen travel quite a distance to come to our fishing grounds. So the irony is you’ll enjoy a far better experience and get a bigger bang for your buck if you ‘cut out the middleman’ and come direct to us in Cozumel. 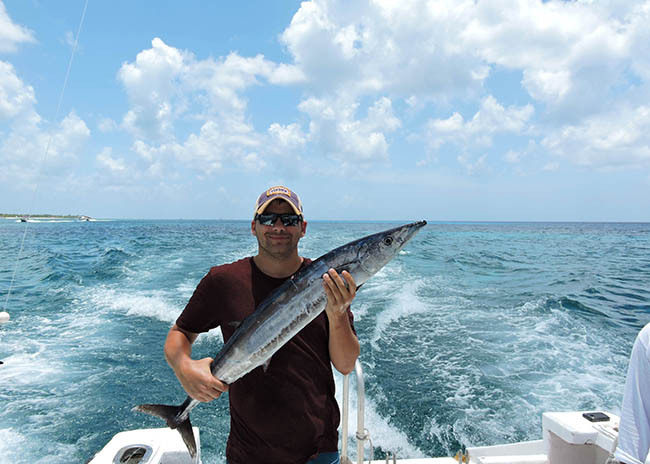 Visting Playa del Carmen - And had so much fun We Booked Captain Alberto Again"
My wife and I were visiting Playa del Carmen and we're excited to go fishing - thankfully we found Captain Alberto from Cozumel online! He had a great boat with all the gear and plenty of drinks, but most importantly a WONDERFUL personality. We chatted and joked the whole trip (he spoke excellent English) and we had so much fun the first time out we booked him again! Not only did we fish, but we did some great snorkeling as well to break up the trip. After snorkeling we caught six or seven fish of different kinds - none of which we've caught before, which was very exciting. Captain Alberto really knows how to find the fish. Better yet, Captain Alberto's brother owned a restaurant by the marina and he cleaned and prepared all of our fish for us! It was the best ceviche we'd EVER had, hands-down. I can't think of a better way to cap off an outstanding day. We'll definitely be coming back to Playa del Carmen again, and will DEFINITELY be booking another trip! So why did Michael and his wife start their memorable fishing trip in Cozumel and NOT Playa del Carmen? 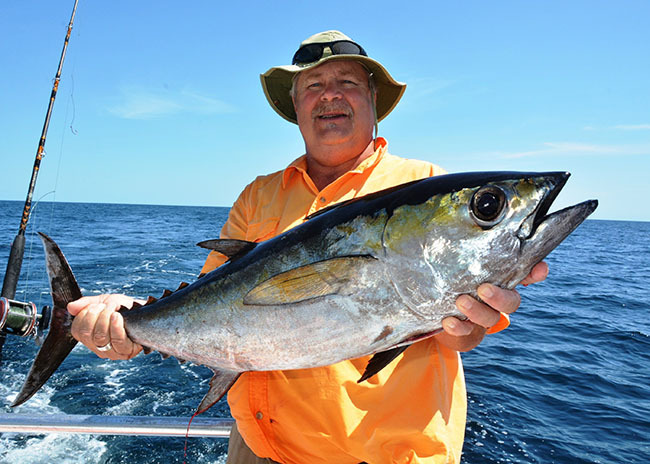 Hola … my name is Alberto Novelo and I and my family have been providing fishing trips in the beautiful world class fishing grounds off Cozumel Island for 37 years. I personally have some 25 years experience as a fishing charter captain and prior to that I was a professional shark fisherman. During those nearly four decades, we’ve delighted multiple thousands of fisher folks – both beginners and seasoned players - many of whom, just like Michael Lewis and his wife, enjoyed the first trip we lay on so much they want to repeat the memorable experience. There is no fishing available on the coast of Playa del Carmen, which is why all the charter fishing boats from Playa del Carmen have to travel quite a way to our beautiful Cozumel fishing grounds. Yellowfin tuna, Blue marlin, Sailfish, Wahoo, and Mahi Mahi (dorados) when going Deep Sea Fishing – and even the rarely-glimpsed blackfin tuna! And if you decide to try your luck at Bottom Fishing you can catch Amberjack, Kingfish, Mackerel, Barracuda, Grouper, Snapper, and Triggerfish. All of these are excellent eating fish. Then, once you land on Cozumel, our boats are just a 3 minute taxi ride away. So within 30 minutes or so of leaving Playa del Carmen you’ll be on board our beautifully equipped comfortable boat. Then – roughly 10 minutes later – you’ll be over our stunning world class fishing grounds, feeling the excitement rising as you get ready to cast your first line. Meanwhile, if you’d settle for one of the Playa del Carmen fishing trips you’d STILL be driving to get to the port where your boat is berthed. THEN you still have to spend between 60 and 75 minutes waiting to get to OUR fishing grounds. All the extras you need are included, such as the Fishing License (plus the additional license to enter the Marine Park, if snorkeling), your Fishing Tackle, soft drinks, beers and bottled water, snacks and fresh fruit and lunch (on the eight hour trips). 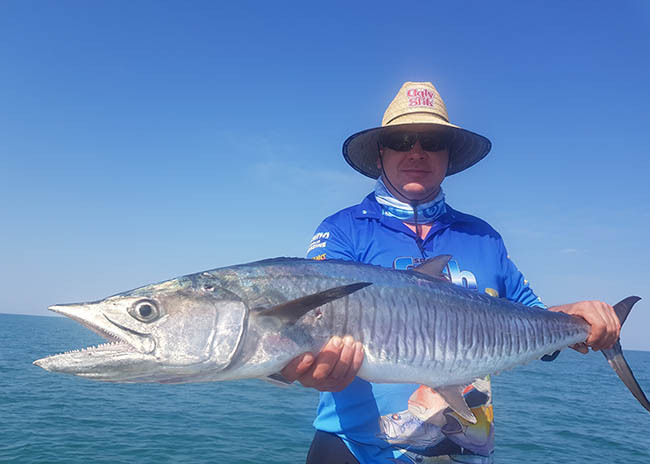 We supply fresh bait to attract fish in droves and give you a far more successful day, because fresh bait is far more effective at attracting fish than the cheap lures used by most of the charter boats. So, in stark contrast to other charters, we always ensure there is plenty of fresh ballyhoo bait on hand. That’s just one way we go the extra mile to ensure YOU enjoy a spectacular day. Booking with us maximizes the value you enjoy because you cut out the middleman. When you book online with us, you are dealing directly with us, giving you maximum value including many items that others would charge extra for. That is in stark contrast to many of the other local fishing charters you’ll find advertising online who are, in fact, merely brokers who take a fat commission and pass a reduced amount to the folks who actually take you fishing. So it’s easy to see how that will dramatically restrict the ability of the charter owner to give you a really great time with the finest equipment and best boats and why they will seek to increase their income by charging you for extra items we supply free of charge. And if you decide to try your luck at Bottom Fishing you can catch Amberjack, Kingfish, Mackerel, Barracuda, Grouper, Snapper, and Triggerfish. The finest boats maintained to the highest standards of safety. Our fleet of 3 boats of 38 ft Hatteras Sport Fishing Boats, fully equipped with both outriggers and downriggers for fishing with four lines at once (some of the local charters only have equipment for two lines). We only use the finest fishing tackle. That’s why we only use Penn International®, Penn Senator® and Shimano® equipment. We provide ample shading and comfortable seating and there is also an inside restroom for your convenience. A professional captain and first mate who speak fluent English so your trip won’t be spoilt by a constant struggle to understand what they are saying. Our captains have 25 years experience and first mates have 15. We will clean, fillet and pack your catch so you can take it away and cook it for your dinner. If you don’t have cooking facilities, then we will take you to our family-owned restaurant near the marina and you can feast on it there. Shade and comfortable seating is a given. So whether you’re just taking a rest from the fishing or just along for the ride, then you’ll be able to relax on a comfortable seat in the shade with a cool drink at your elbow – bliss! Children, too! We allow children aged three and over to join in the fishing – provided they are closely supervised and we supply special light fishing tackle for them to use. Children aged one and over are also most welcome, provided they too are looked after at all time by their parents. 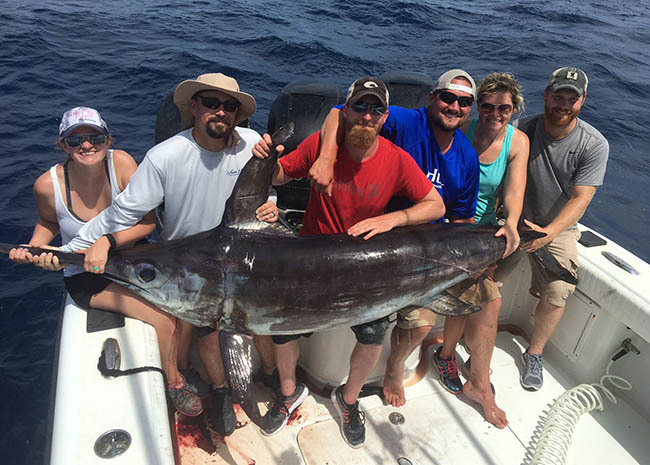 You’re dealing with a family owned and run business, unlike other local fishing charters. We came as strangers and left as Family"
We found Captain Alberto through his Website and decided to give him a shot. All I can say is that it was the best decision we've made thus far in Mexico this time. Not only was Captain Alberto a professional fisherman who runs a tight ship; but he also genuinely cares for his customers and goes way beyond the obligations that were paid for. After the numerous fish we caught; we marched right over to a restaurant he deals with and we had our catch as lunch with basically all the other captains in town as well as the dive boat guys. We will be back soon to fish with him and will be sending our friends to fish with him also. We came as strangers and left as family. What sets us apart from other Fishing Charters? We are a family owned, run and staffed business and so far more motivated to make your trip wonderful in a way no employee could ever do. Our fleet of 3 boats of 38 ft Hatteras Sport Fishing Boats, fully equipped with both outriggers and downriggers for fishing with four lines at once – in contrast to some of the local charters who only have equipment for two lines. Our boats are also equipped with a fighting chair and belts. And when you’re not fishing or snorkeling, you can relax on the boat’s shaded, comfortable seating, sipping a cool drink. There is also an inside restroom for your convenience. We are one of the very few tour companies authorized to visit the most stunning reefs, which are located inside the protected area of the Cozumel Marine Park. So – if you are planning to snorkel – then you are guaranteed the snorkeling experience of a lifetime. We not only allow you to bring your infants, aged one and upwards, we also allow your children aged three and upwards to fish and snorkel. They must all be supervised by one of your party at all time and a member of our crew will also be close at hand when under the water for extra safety. 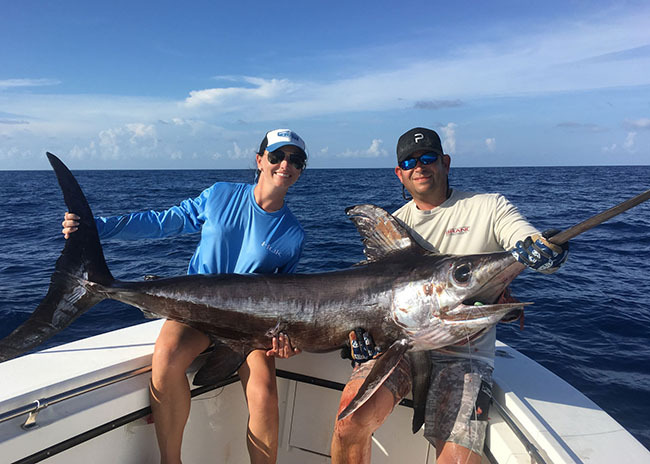 No other local Fishing charter business offers this unique combination, which is your guarantee of a stunningly memorable day. 4 hours - Our most Popular Option for those Travelers that want to squeeze a quick Fishing trip among other activity they have planned to do while visiting the Island. 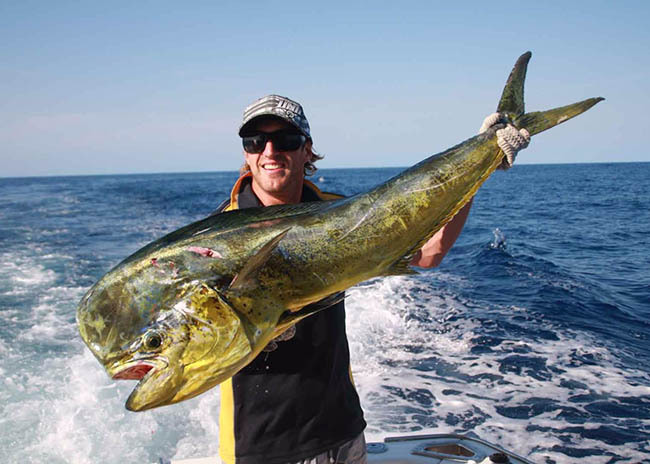 6 hours - The prefered choice amongst Anglers that are new to Saltwater Deep Sea Fishing. Also the preferred option amongst Families. 8 hours - The right choice for those serious Anglers that want to maximize their chances of targeting several species in one same Fishing Trip. 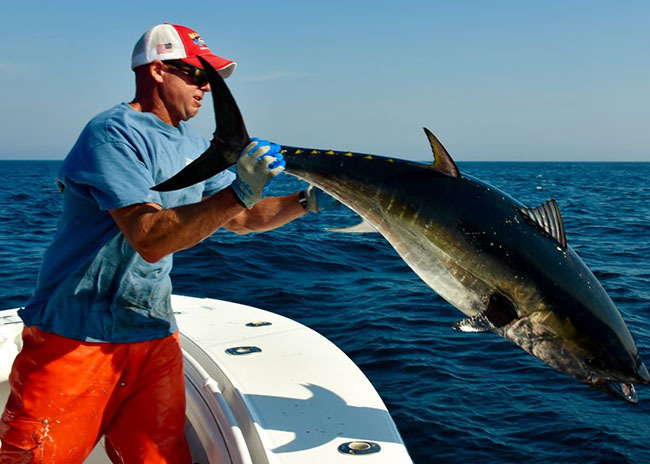 Deep Sea Fishing - The right choice for those Anglers looking to catch game fish such as Mahi, Yellowfin Tuna, Wahoo. Marlin and Sailfish on season. (Available on 4hrs, 6hrs, or 8hrs lengths). Bottom Fishing - The tried-and-tested option to catch fish almost all the time. Go for Grouper, Snapper, Mackerel, Amberjack, Barracuda, and Triggerfish. (Available on 4hrs, 6hrs, or 8hrs lengths). Deep Sea & Bottom Fishing Combo - The prefered Combo for those that want to experience the best of both Fishing techniques and maximize their chances of catching fish. (Available ONLY on 6hrs, and 8hrs lengths). Fishing & Snorkeling Combo - The favorite Combo for Anglers with Families that want to experience the best of both Worlds: Fishing & Snorkeling. (Available ONLY on 6hrs, and 8hrs lengths). I've been in a couple of Deep Sea Fishing Trips, however none in this setting..."
The online booking went smoothly. The boat was amazing, the staff even more amazing and very friendly crew. I went by myself and caught 3 Mahi mahi, a Mackerel and two very large Wahoos. The Wahoos both hit at the same time on different rods. I reeled one in, took pictures of it and the staff kept the second one on until i was ready for it. I have been on a couple of deep sea fishing trips, however none in this setting. It was by far worth every penny and I HIGHLY recommend Captain Alberto from start to finish. I will definitely be back and book with Captain Alberto! But if you want to almost guarantee to catch some fish (about 95% of the time) then Bottom Fishing would be your choice. This technique usually produces the best eating fish, which we’ll be happy to clean and pack for you to enjoy for your dinner. Or - if you can’t wait that long, you can eat it at my brother’s restaurant at the marina. And about an hour once we found that spot we had caught 5 large Amberjacks - Great Bottom Fishing Trip for an Experienced Fisherman or a Newbie"
We met Captain Alberto about 8:30 in the morning at the Marina. He was very friendly and welcoming from the start. We tried two spots with no success, but the third was our Magic Spot. We were catching fish after fish. And about an hour once we found that spot we had caught five large amberjacks, ranging in size from 20 to 50 pounds. We had one more on line, but it broke and that one got away. Captain Alberto is an absolute beast jigging those fish. We were catching them in about 150 to 200 feet and reeling them in was tough, exhausting work. I have new respect for these guys that reel in those huge fish with nothing to support themselves to the boat. Captain Alberto and his helper could not have been nicer and more accommodating. Thank you for such a great morning on the water! Or why not enjoy the best of both worlds by combining Deep Sea Fishing with Bottom Fishing? Or how about combining Fishing with Snorkeling? You probably noticed that part of Michael’s super day included a session snorkeling in the beautiful Cozumel Marine Park. We are proud to be one of the very few businesses licensed to enter this heavily protected environment, because we operate well maintained boats that will not damage the delicate ecology of the park. That means you can enjoy swimming among some of the most spectacular underwater coral reef scenery you’ll find anywhere on earth, with its magnificent variety of colorful fish, including turtles and graceful rays. 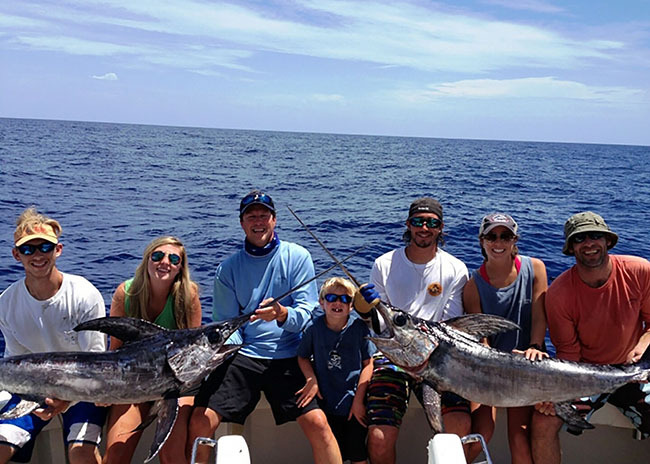 Great Fishing and Snorkeling with the Family - We absolutely Recommend a Trip with Captain Fernando!" Our family, with two children 4 to 7 years, went on a 6 hour tour with Fernando (Captain Alberto’s son) - fishing and snorkeling combo. It was very successful! Fernando is a very friendly and knowledgeable guide, the boat is strong and the equipment is of good class. Free drinks and snacks included. We tested different types of fishing and caught both large and small fish. The snorkeling was very good, saw both turtles and rays. We absolutely recommend a trip with Captain Fernando. All fishing tackle and live bait. We carry light tackle for kids too. Fishing Licence. Boat ride in our Sport Fishing Boats. Professional and English speaking Captain and his First Mate. All snorkeling gear (when the Fishing & Snorkeling option is selected). EVERYTHING. This is an All-Inclusive Trip. No worries. All tackle and fresh bait is provided. Yes, our Staff speak English. Your choice of start times: on the hour from 8:00am until 2:00pm. Wahoo, Mahi-Mahi, Yellowfin Tuna, and Barracuda when Deep Sea Fishing (Blue Marlin & Sailfish on season only). Grouper, Snapper, Triggerfish, Mackerel, and Amberjack when Bottom Fishing near the Reefs with weighted lines. 38ft Hatteras Sport Fishing Boats. Equipped with Outriggers and Downriggers too. Fighting chair and Fishing Belts. Open Cabin and Shaded seating space for your comfort. Combination of Deep Sea & Bottom Fishing (at least 6hrs). Fishing & Snorkeling (at least 6hrs). Coming from Playa del Carmen or elsewhere on the Mayan Riviera? Then you'll arrive on Cozumel at the Ferry Pier. From there it's just 3 miles to 'Marina Caleta', straight via Cozumel´s Oceanfront Boulevard. It's probably too far to walk, although I'm sure the folks at the ferry pier will be happy to point you in the right direction, if you choose to do that. If you are staying in Cozumel: Alternatively, you can get a taxi, which will get you to 'Marina Caleta' in about 5 minutes. And there are plenty of taxis to take you back to the Ferry Pier after the fishing trip. Make sure to catch a Ferry at least 1 hour before your scheduled fishing trip depart time. We recommend you to schedule your Fishing Trip to start at 8am, and catch the 7am Ferry. You’ll be amazed how clean and ‘shipshape’ everything is. And you’ll note with satisfaction they are fully equipped with both outriggers and downriggers for fishing with four lines at once, in sharp contrast to some of the local charters who are only equipped for two lines. And you’ll be even more delighted to realize you can understand every word our captain and crew say, because they all speak fluent English. You’ll feel your excitement rise to fever pitch as the powerful eco-friendly engine bursts into life and we cast off to begin your adventure of a lifetime! You will hardly notice the ten minute trip to the fishing grounds because you’ll be absorbed by the beauty of the Cozumel coastline and – if anyone plans to go snorkeling - there will be a demonstration on how to use the high quality snorkeling equipment. The superb fishing tackle you’ll be using, which is all of the finest quality supplied by Penn International®, Penn Senator® and Shimano®. You’ll also notice we have ample supplies of fresh ballyhoo bait, which is far more effective for catching fish that just the lures some charters settle for. Then, when we arrive at the beautiful Cozumel fishing grounds just 10 minutes after leaving the shore. You can congratulate yourself on being so smart. 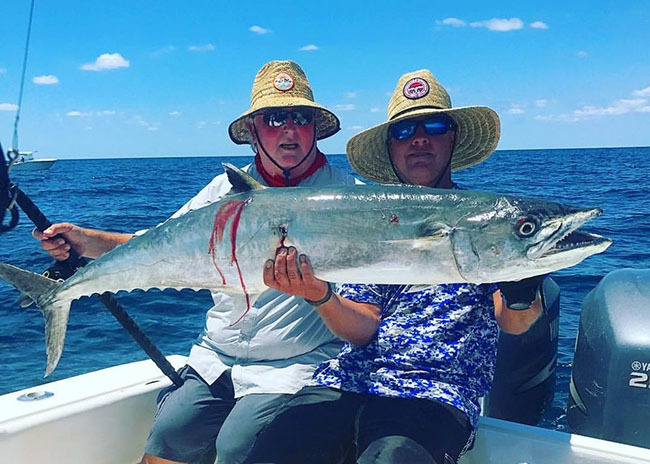 Because, if you’d made the obvious choice and chosen a Playa del Carmen fishing trip with a Broker, you’d STILL be traveling just to get to the boat. Fishing boats are berthed way down the coast from Playa del Carmen, requiring a long drive of nearly an hour to get to them. And then the Playa del Carmen boats have to make a trek of an hour or more to get to our Cozumel fishing grounds, because there is nothing else like it in the Playa del Carmen area. 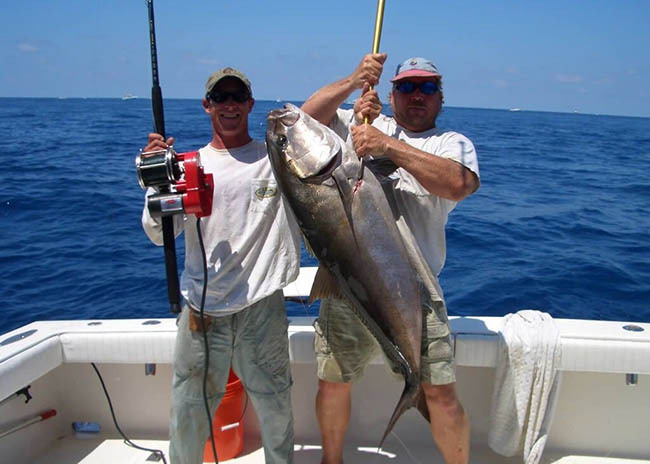 You see, our wonderful fishing grounds - absolutely teems with the very best game fish, such as … sailfish, yellow tuna, , wahoo, amberjack, blue marlin, kingfish, barracuda, grouper, snapper, mackerel, triggerfish,– mahi-mahi (dorados) – and even the rarely-glimpsed blackfin tuna! And they are all waiting for you to catch them! 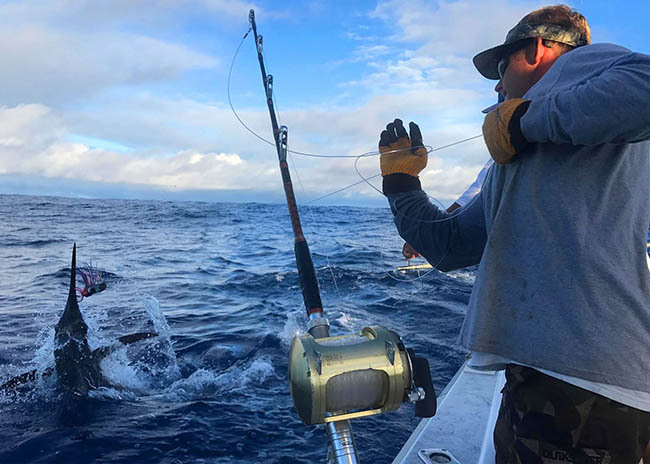 Is exciting and can be very spectacular, if you want to almost guarantee catching fish about 95% of the time, then bottom fishing is the way to go. This technique usually produces the best eating fish, which we’ll be happy to clean and pack for you to cook and enjoy for your dinner. But if you can’t wait even that short time, you can eat it at my brother’s restaurant at the marina, once we have landed. And if you’ve chosen to combine both fishing and snorkeling on this trip then you are in for a truly wonderful experience! One of the very few business licensed to enter the protected Cozumel Marine Park, where the most magnificent corals lie and where the most spectacular fish dwell. As we operate superbly maintained boats that do not damage the delicate ecology of the park. That means you can enjoy swimming among some of the most spectacular underwater coral reef scenery you’ll find anywhere on earth, with its splendid variety of colorful fish, including turtles and graceful rays. No matter how many times you’ve snorkeled before, nothing will have prepared you for the dazzling beauty of the alien, silent world you’ll enjoy in the warm, crystal-clear waters – a stunning panorama of bright corals, astonishing sea plants in vivid colors and amazing shapes and fish so exotic it’s hard to believe you’re still on planet Earth. Just how exclusive our tour is because you’re unlikely to see any other snorkelers apart from any others from your party. Then all too soon, it’s time to get back on the boat for our short trip back to the shore. And, if you’ve caught some fish, the swim has probably sharpened your appetite and you’ll be looking forward to eating it at my brother’s restaurant at the marina. Astounded at the amazing value you’ve enjoyed, you’re probably already planning your next trip with us, like so the many others of our delighted clients who return again and again. 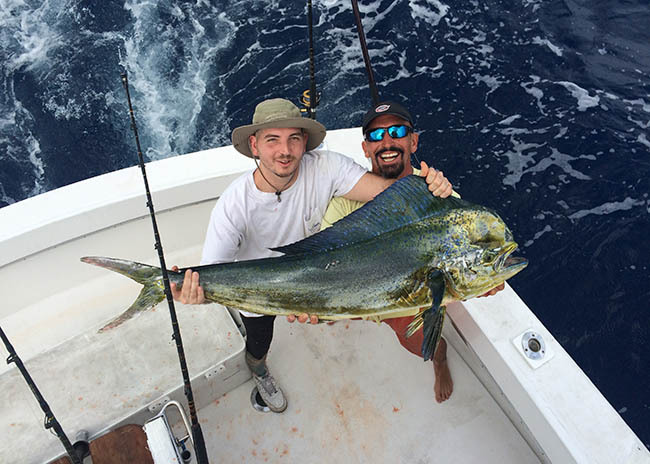 Deep Sea Fishing not for the faint of heart – Definetely recommend using Captain Alberto's Charter!" 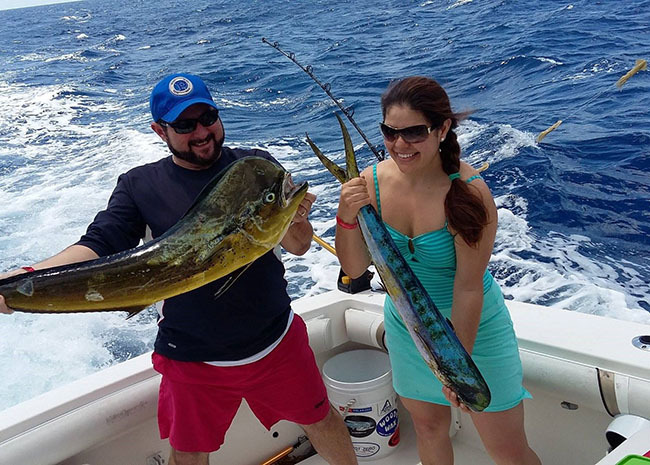 Captain Alberto takes you on half day or whole day deep sea fishing trips. Participants have an opportunity to catch multiple fish species, from grouper, triggerfish, sailfish or sharks! You never know what you might catch and bring aboard. Like me that brought three groupers and two fierce sharks aboard for later release. Very professional, knowledgeable and friendly captains and crews! 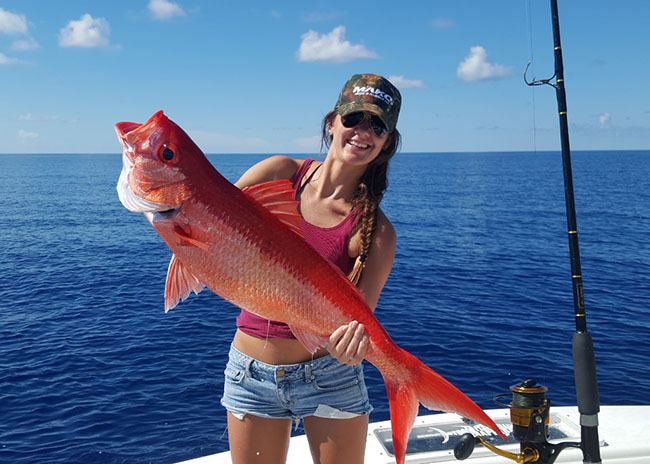 Definitely recommend using Captain Alberto's charter if you plan to do some deep sea fishing. The good news is that by booking directly with us, you cut out the brokers who are particularly prominent in the local fishing charter business, instantly slashing about 40% off your cost. What’s more, by booking online, you’ll save even more and enjoy the advantage of being able to instantly check if the day you want is still available. What’s more, many of the items that other operators might charge you for - such as the Snorkeling Equipment (should you choose to do a combination of Fishing and Snorkeling), the entry fee to the protected Marine Park and the beer, soft drinks and water are all included in your fee. Passengers beyond 6 are $50USD extra up to a maximum of 12. Combined Deep Sea Fishing and Bottom Fishing. Please note the combined fishing and snorkeling trip requires either a six or eight hour trip, because there’s so much to pack in. On the 8 hour trip we serve lunch with our compliments. Last week 24 Travelers booked our Fishing Trip to go after Mahi & Yellowfin Tuna. Today it's your turn..
We focus on QUALITY – rather than quantity. So we have just 3 of the finest quality boats and crews in our fleet. And, because we are one of the most sought after fishing charters, both on Cozumel and in Playa del Carmen and a large number of our clients come from the cruise ships, which bring around 20,000 cruise visitors daily - we tend to get booked up lightening fast every day of the week. This is particularly so with our combined fishing and snorkeling trip, because we are one of the very few charters licensed to enter the highly protected Cozumel Marine Park. And that’s important for you to enjoy the very best snorkeling experience because that’s where you’ll see by far the most spectacular fish swimming around the unspoilt coral reef, which is second only to the Great Barrier Reef in Australia. Remember, we only have 3 boats in our fleet. So, if you want to ‘think about it’, then you risk coming back later and being gravely disappointed because the day you wanted has been taken. That means, you might have to settle for a second rate trip from another fishing charter, which might not be able to boast of such highly maintained boats. And, if you wanted to enjoy some of the best snorkeling in the world together with your fishing, they probably won’t be licensed to enter the Cozumel Marine Park because very few boats are. But all three of OUR boats have passed the very stringent tests. So you’ll have to make do with the far less spectacular reefs with greatly reduced fish numbers and species range. And, if you can arrange to snorkel, you’ll have to contend with a great deal more people doing the same thing. You can be smart, quickly decide which day you want to become the memory of a lifetime and book your boat, right away while it’s still available. Then you can relax and look forward to your memorable day with growing excitement! I and all my family are eagerly looking forward to welcoming you to Cozumel and sharing our amazing fishing (and maybe, snorkeling) experiences with you! Departures: We can start the trip at any time to suit your party from 8.00am through 2.00pm any day of the week, including Sundays. The Boats: The finest boats maintained to the highest standards of safety. Our 3 boats fleet of 38 ft Hatteras Sport Fishing Boats, fully equipped with both outriggers and downriggers for fishing with four lines at once. We are fully equipped with a fighting chair and belts. And we have an inside restroom for your convenience, as well as plenty of shade and comfortable seating if you are just enjoying the boat ride. Inclusions: Unlike other tours which might initially seem better value and then charge you for extras, we include everything you need to make your day perfect. So the extras other operators might charge you for – such as the Federal fishing license and (if snorkeling) the license to enter the protected Marine Park, all Fishing Tackle, including Fresh bait (far better than simple lures) plus all the drinks and lunch (on the 8 hour trip) are all included in the basic fee. Exclusions: The only items we exclude are expenses you would reasonably expect to pay for yourself, such as the ferry to Cozumel and the taxi fare to the marina. 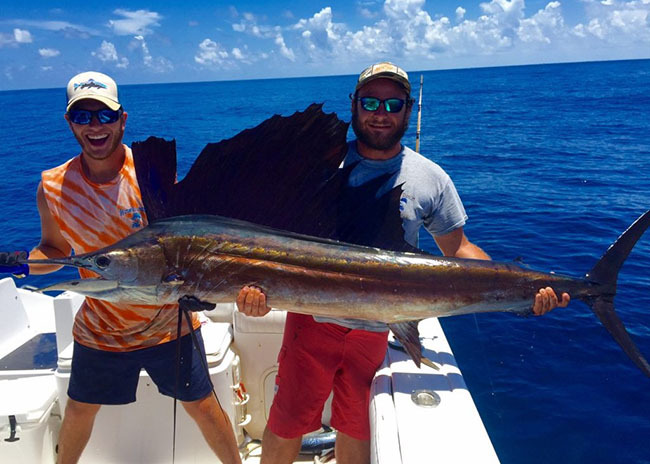 My son had a great time, caught his first Mahi Mahi, and it was tasty – Great, easy to book Family Friendly fishing excursions..."
This is a very safe and professional outfit that was super easy to work with. Easy to book online. Good website with detailed information. Very accommodating to families and those who just want to hang out rather than fish. My son had a great time, caught his first mahi mahi, and it was tasty! Took it to a local restaurant to cook and eat straight off the boat. Delish! Over 20 Travelers just last week rated this Fishing Excursion 5 stars. Are you going to miss it? Remember we ONLY have 3 boats and we often get overwhelmed with the bookings from the 20,000 cruise passengers that arrive in Cozumel daily. 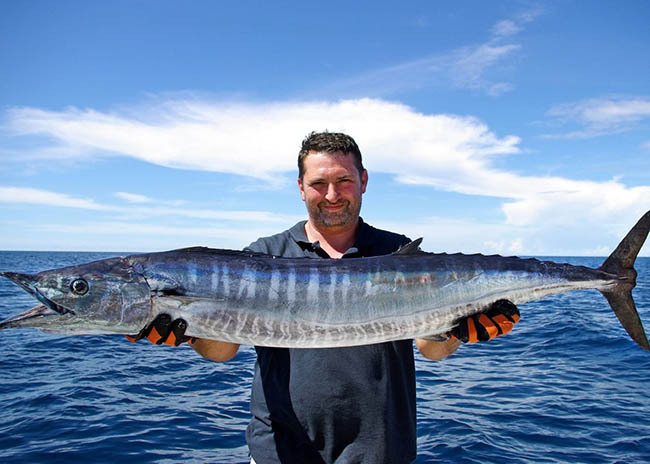 I know you’d bitterly regret it if – now you know what a stunning day awaits you with our fishing charter - you don’t go ahead right away and get beaten to it by someone who books ahead of you. So I strongly urge you to check the availability of your chosen day - right now – and then go ahead and book your charter. If you don't book a Trip with Captain Alberto, you will miss Something Outstanding!" My husband Charlie and myself booked a private fishing trip and were lucky enough to sail on the Miss Allison II with Captain Fernando and First Mate Chuy. To say the trip was a dream come true would be an understatement. My husband caught the first fish, a nice tuna. I gladly took the second fish that turned out to be my elusive sailfish that I have tried for over 8 years to land. As I watched this fish jump out of the water my heart pounded and I could not contain my excitement. I cried like a baby after we released it and could not believe the #1 on my bucket list was complete thanks to this fabulous fishing trip. If you don't book a trip with Captain Alberto you will miss something outstanding. We are staying in a hotel either in the Mayan Riviera region or in Playa del Carmen. Can you pick us up at the Hotel Pier or do we take the ferry to Cozumel? YES. You take the short ferry trip (about 25 minutes) to the island of Cozumel where our boats are based. The meeting point is the “Marina Caleta” – just a mile along the shore from where you arrive on the ferry at the Ferry Pier. Alternatively, a taxi from the Ferry Pier will get you to our boat in about three minutes. We are arriving on a cruise ship. Do you pick us up at the Cruise Pier or do we have to come to you? YES. You meet us at the “Marina Caleta” on Cozumel – just a few minutes by taxi, which you’ll be able to hire right by the Cruise Pier. We are coming on the ferry from Playa del Carmen, how do we find you? You will arrive at the Ferry Pier, which is about a mile from where our boats are berthed at the “Marina Caleta”. You will receive full directions with the confirmation of your booking if you want to make the gentle stroll along the shore. Alternatively, you’ll find plenty of taxis at the Ferry Pier. The fare for four people to the marina is just $8USD and the journey takes just a few minutes. What time does your charter start and how long does it last? We can set off at any time to suite you from 8.00am to 2.00pm. We offer trips lasting four, six or eight hours. If you are fishing and snorkeling trips need to be of six or eight hours to fit it all in. How many passengers do your boats take? All 3 of our top quality fishing vessels can take up to 12 passengers. I see your fishing trips are based on a minimum party of six people, but we have only three people in our party. Could you book us in with another similar sized party and split the payment between us? Your wishes about your charter are paramount, because it is YOUR private charter for the duration of the trip. So we would not put that in jeopardy by adding another party, with different requirements, to your private charter. What fishing tackle do you provide? In short, only the best: Penn International®, Penn Senator® and Shimano® equipment. Unlike most local fishing charters, we also supply fresh bait, because this gives you far better results than the lures that most charters use. So – if you see a slot you want – book it right away. Because so many of our charters are booked by the 20,000 daily cruise visitors, the free slots tend to disappear very fast. You will need to catch a ferry at least ONE HOUR BEFORE our scheduled departure time. The ferry runs every hour from 7.00 am to 11.00 pm. So, if you want to make an early start with us, take the 7.00 am ferry and you’ll be in good time for departure at 8.00 am. Our meeting point at “Marina Caleta” is only a mile from the Ferry Pier, which is where you will arrive on Cozumel. You will receive full directions in the email confirming your booking. Alternatively you can take a taxi from just by the Ferry Pier which will drop you off at the “Marina Caleta” about 3 minutes later. NO. Unlike other fishing charters, the cost of your mandatory federal fishing license and (if applicable) the license to snorkel in Cozumel’s magnificent Marine Park, fishing tackle and fresh bait (the best kind) and cold drinks are all provided, with our compliments, free of extra charge. On the eight hour trips we also provide lunch with our compliments! YES. And we take care of your comfort with plenty of shade and comfortable seating on the boat. NO. This is one expense you will have to carry, because it would not be fair to our clients who come from the cruise ships. Do you cover the cost of my taxi from the pier to your boat? NO. This is another small expense you will have to carry. © 2000 - 2019 Riviera Maya Deep Sea Fishing. All rights reserved.